Keep off the grass in the quad at Jesus College. Day 3 of our adventure in England was packed with discoveries, revelations and inspiration. 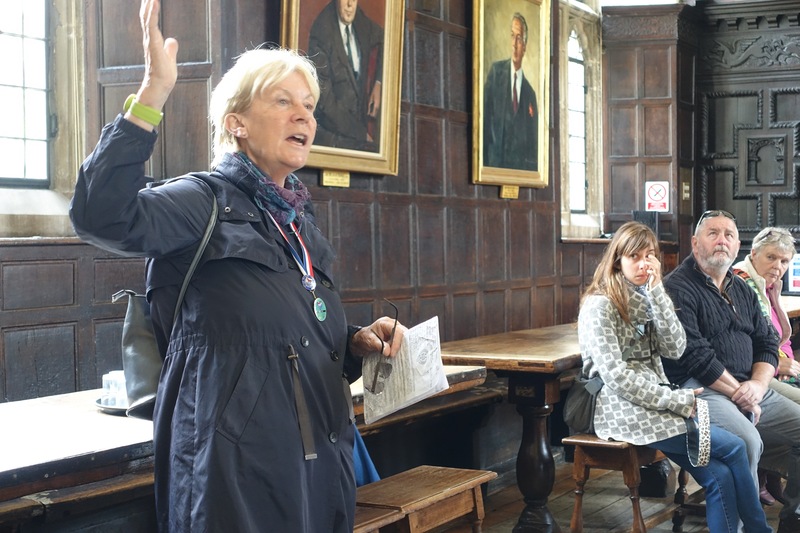 We walked a mile from our flat to the center of town to join a tour highlighting important sites, including one of Oxford University’s 38 colleges. Katie, the guide on our walking tour, gave us good sense of what Oxford is all about. Our personable guide, Katie, introduced us to the centuries-old university and how it works: each college independent yet allied; nearly all quite small (just 22,000 students in the entire system), housed primarily in decorous stone buildings surrounded by well-worn walls (yet open to the public at certain times). The schools, with their manicured courtyards, ornate edifices and streams of students, dominate the look and feel of the central city. We visited Jesus College, co-founded by Queen Elizabeth I in the 16th century for the people of Wales. Students live, study and play together on the campus, where they meet with their professors once a week for “tutorials” in which they review projects assigned throughout the eight-week terms. 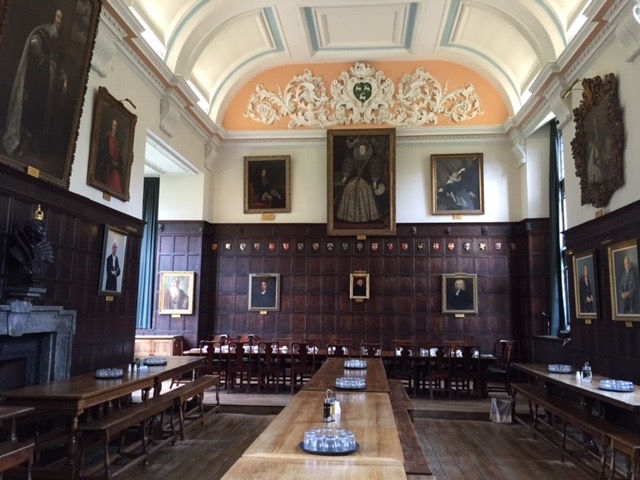 The dining hall at Jesus College. Students go off the grounds to auxiliary campuses around the city for lectures, research and more. The “collegiate” feel of the place came across most vividly in the dining hall with its soaring leaded-glass windows, carved oak panels and enormous communal table. I expected to see Harry Potter at any moment. 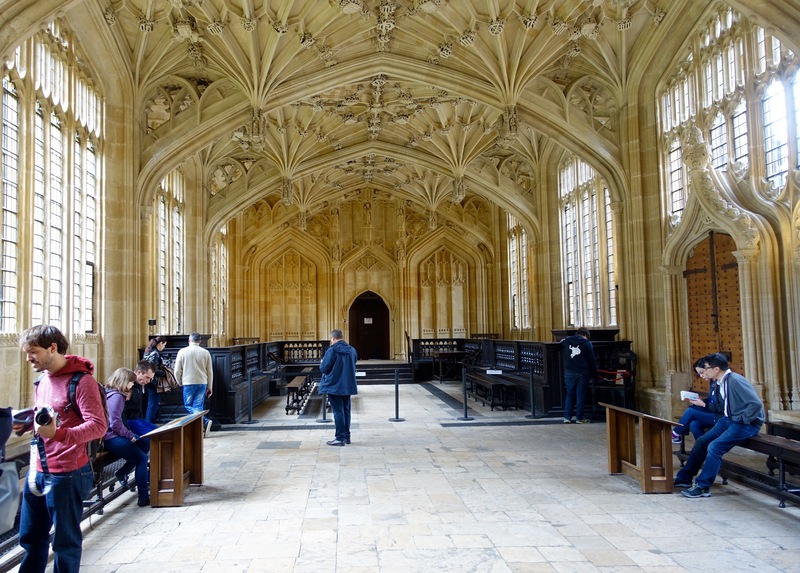 Speaking of which, we had a chance to walk through the old Divinity School now surrounded by the incredible Bodleian Library (which houses more than 13 million volumes and counting). The school, made entirely of carved stone, is a wonder of architecture and beauty. A ballroom scene in one of the HP movies was filmed here. The carved pillars fan out across the ceiling to support the terrific weight of stone. 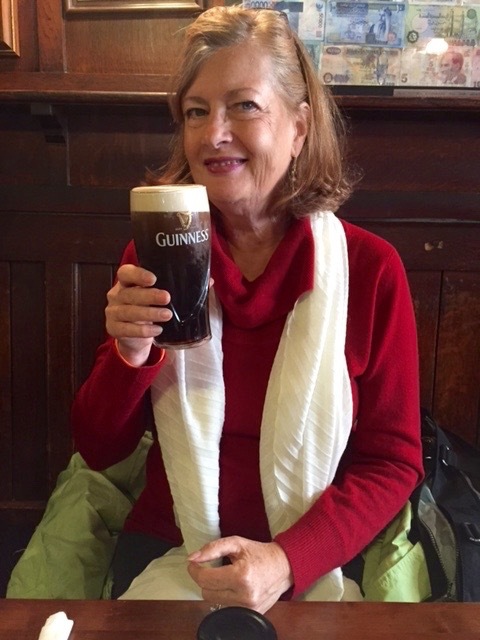 We celebrated all that we’d seen by stuffing ourselves at the cozy White Horse pub (one of the city’s oldest); fish & chips and a pint of Guinness for me, “toad in the hole” for John. The pub appears in the Inspector Morse TV series, which we hope to find time to watch (our apartment has the complete set of DVDs). Kathy lifts a pint at the White Horse pub. After a rest back at the flat, we returned to the central city and the newest part of the Bodleian (the Weston Library) for what may have been the most extraordinary “college lecture” I’d ever heard. John has already written about Professor Wells (emeritus, Univ. of Birmingham), but I thought I’d share a few impressions, too. We are still discussing all that he said, looking up film clips of Judi Dench as Lady Macbeth, finding Sonnet 29 to read again, and so on. Such is the “imprinting” power of a fine teacher/writer. As an editor most of my working life, I trafficked in the power of words. Wells spoke with passion and insight about Shakespeare’s skill and why he still matters more than four centuries later. 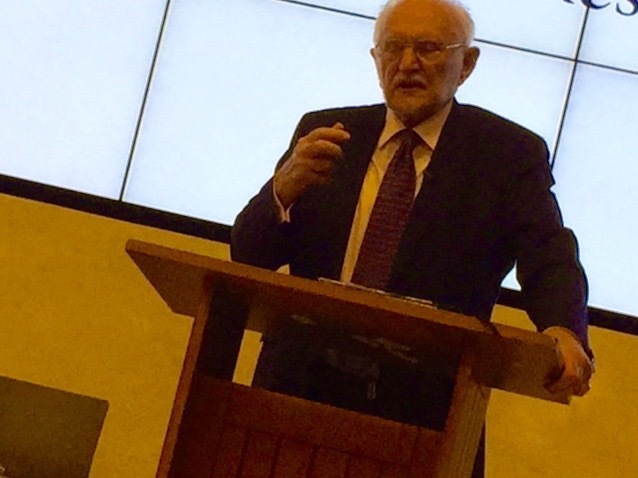 Stanley Wells. a master of his subject and of the lecture. Quoting from memory Hamlet, Lear and more, he made us feel the lyricism of the words, moving from complex syntaxes to simple declaratives, soft and loud, thoughtful and emotional; sometimes simply silent. More than the meaning, we felt the majesty. Beyond the skill at crafting words, Wells explained, Shakespeare possessed the ability to convey a set of values that live across the ages: the importance of intelligence and wit, of moral courage and plain kindness; an appreciation of individual idiosyncracies (“what a piece of work is man”) and of the transformative power of imagination. Certainly, Professor Wells possesses transformative powers of his own. Ah, to have been his student! 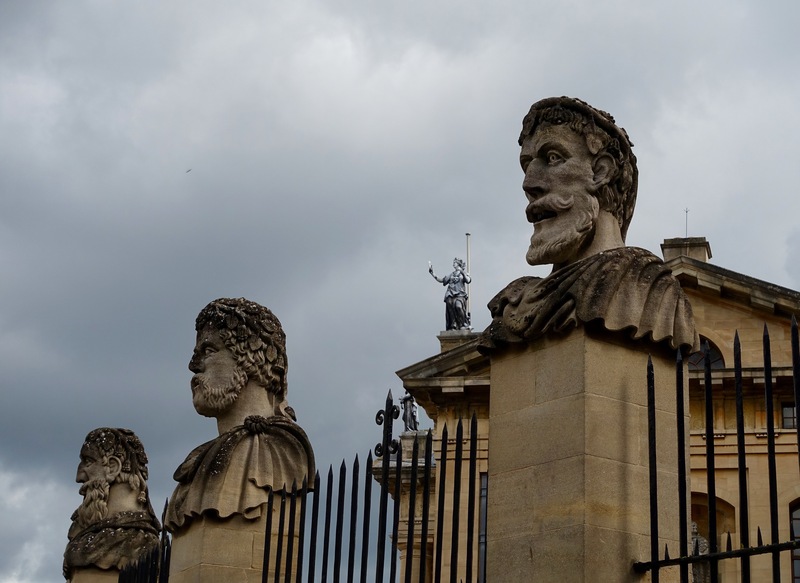 The terms — after the Latin word terminus — surround the Sheldonian Theater, which hosts many events including Oxford graduations. 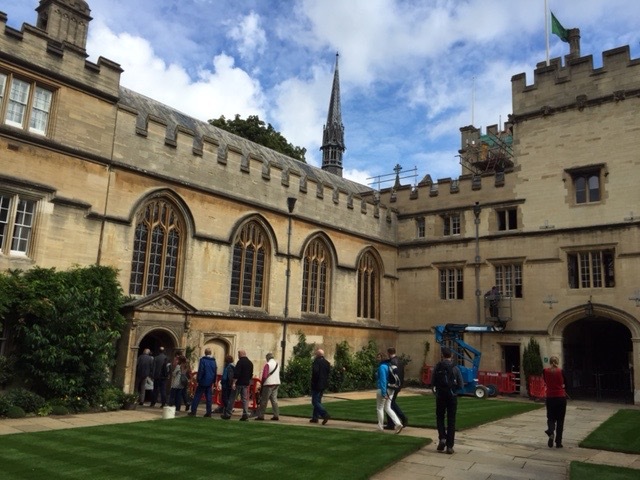 Posted on September 4, 2015 September 11, 2015 by jbsaulPosted in TravelTagged Bodleian Library, Harry Potter, Jesus College, Marks of Genius, Oxford University, Shakespeare, Stanley Wells.